LET’S PLAY‭ (‬with‭) ‬music.‭ ‬Music is an umbrella beneath which we are walking together as a couple in an embrace.‭ ‬How can we use it to enrich our dance‭? ‬How can simple change of velocity change the quality and‭ ‬what we are expressing‭? ‬We hear many times that emotions‭ ‬are energy in motion.‭ ‬LET’S PLAY with emotions being the generator for our movement,‭ ‬our dance.‭ ‬How do the‭ ‬touch,‭ ‬the communication,‭ ‬the density,‭ ‬the dinamics,…‭ ‬change‭? ‬-Free your body so you can play‭! In order to be free in dance we need to be able to have control over our body.‭ ‬LET’S‭ ‬work out our bodies,‭ ‬become friends with the technical part of the dance and‭ ‬PLAY through exercises that will help us with our balance,‭ ‬relaxion,‭ ‬presence,‭ ‬confidence and trust. ‬LET’S PLAY‭ ‬(again‭! ‬…and always‭!) ‬with the embrace.‭ ‬Embrace is an alive thing.‭ ‬It is not a position of our body and arms.‭ ‬It’s a constant flow of energy from your feet up to your head,‭ ‬doubled in your partner and then brought together to become a bridge for communication.‭ ‬It has an imense power.‭ ‬We shall work on becoming more conscious of it and how we can use it for more flow and pleasure in our dance. ‬Milonga makes us move.‭ ‬It’s fun,‭ ‬it’s fast,‭ ‬we goooo….‭ ‬But there is another beauty inside of this earthy dance.‭ ‬LET’S‭ ‬explore and‭ ‬PLAY‭ ‬how to move slowly in order to create special dinamic and diversity‭ (‬and not sweat too much‭ 😉 ) ‬. GUSTAVO was born in Buenos Aires and grow up in Córdoba, Argentina. From a young age, he attended various dance and music schools, where he studied ballet, modern dance and Argentine folklore; He later specialised in Argentine tango, milonga, and vals porteño. His ‘Salon style’ can be described as surprising and harmonious and is led by his profound musicality and exploration of rhythms and dynamics, developed during his studies and further experience playing the guitar and violin. As a dance teacher he focuses and accompanies the students on their path of physical awareness and finding their own centres from where they can begin to explore tango as an expression of their own improvisation and spontaneity. He gives the students the necessary tools and foundations to build upon their experience and guides them along their journey towards this beautiful dance. Gustavo lives in Berlin since 2005 and works all arround Europe. 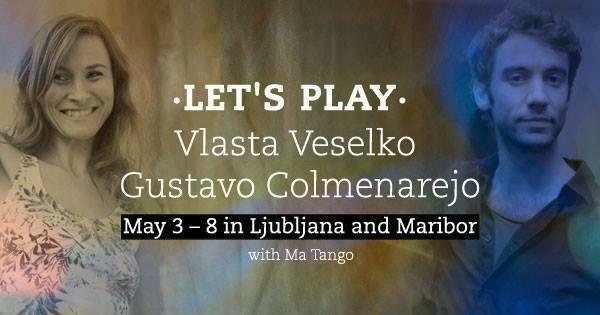 VLASTA is a tango dancer and teacher coming from professional contemporary dance. As she got to know Argentine tango in 2008 she went to Buenos Aires to learn the magic of this wonderful dance there. She spent there altogether three years, learning, practicing, performing and also teaching. In April 2016 she moved back to Slovenia and started more seriously to dedicate her time to teaching at her home country and traveling in Europe.